As promised, we’re happy to present the next installment of artist YurkP’s tutorial of his Cuban House of Diversity model. Today’s segment will cover flipped normals and smoothing groups. You can read last week’s segment about Reference and Scene Prep here. At first, I thought this object might be too easy for this tutorial. However, I found some tiny things, which, in my opinion, will be useful for beginners– namely, flipped normals and smoothing groups. I started this process with a spline (image 1), to which I applied a Lathe modifier and moved the axis to fit the real world size of the object (image 2). After converting to an Editable Poly, I recognized a hole inside the vase (image 3), which I was able to correct this by welding the vertices together (image 4). This is a useful step because it will decrease your verts and triangle count. After operations such as Lathe or Sweep, normals of faces may be flipped in the wrong direction (image 5). It’s difficult to work with flipped normals, and you shouldn’t connect two objects together if one of them is faced in the wrong direction. To fix, I pressed the “Flip” button in Editable Poly menu to invert normals of the object (image 6). As you can see, the front side of faces are highlighted with a bright red color, and the back side of polygons are highlighted with a dim dark red. This coloring makes it easy to identify flipped normals. 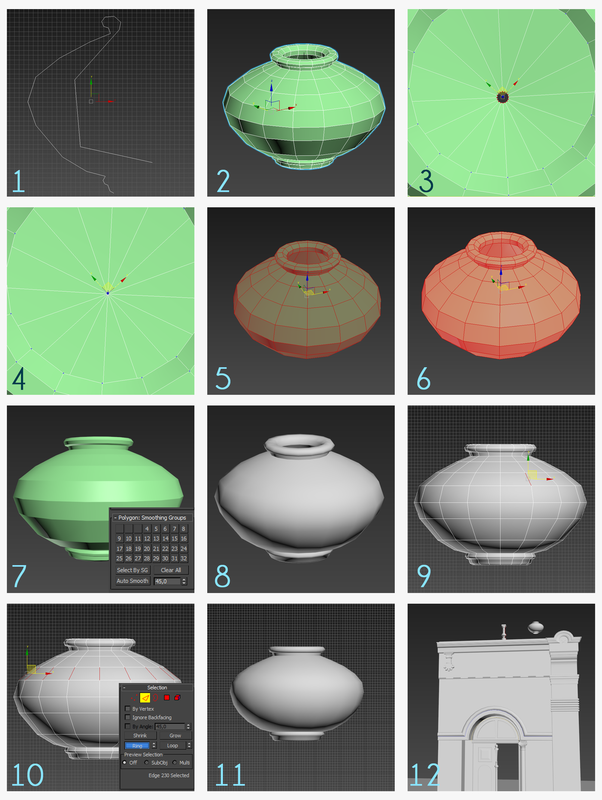 Moreover, you will have artifacts after rendering if you will leave the model as it is shown in image 5. Applying the Lathe modifier automatically assigns smoothing groups to your objects, but they are assigned incorrectly (image 7). This can be corrected by pressing the “Clear All” button under the smoothing group window (image 8). It will remove all smoothing groups, and then you’ll be able to assign them manually. If your model seems too edgy or awkward, consider adding more lines (image 9). This can be done by selecting one edge on the surface. From there, I pressed the “Ring” button to select all edges around the selected surface, and then pressed the “Connect” button to scale the new line (image 10). Now, it is more smooth–enough for real-time engines, but not enough for static renders and movies (image 11). Your polycount should be selected depending on your goal. When the object is compared to the whole building, you’ll notice that it is small and the corners are not visible (image 12). If it were bigger, I would make it with a higher poly count. Explaining normals is a very large topic. It’s too big to discuss in this tutorial extensively, but I can show you briefly how it’s done. If you want to learn more about normal maps, this blog post can be a good starting point. In this image, you can see that normal direction sets shading and reflection, and smoothing groups can regulate normals direction. 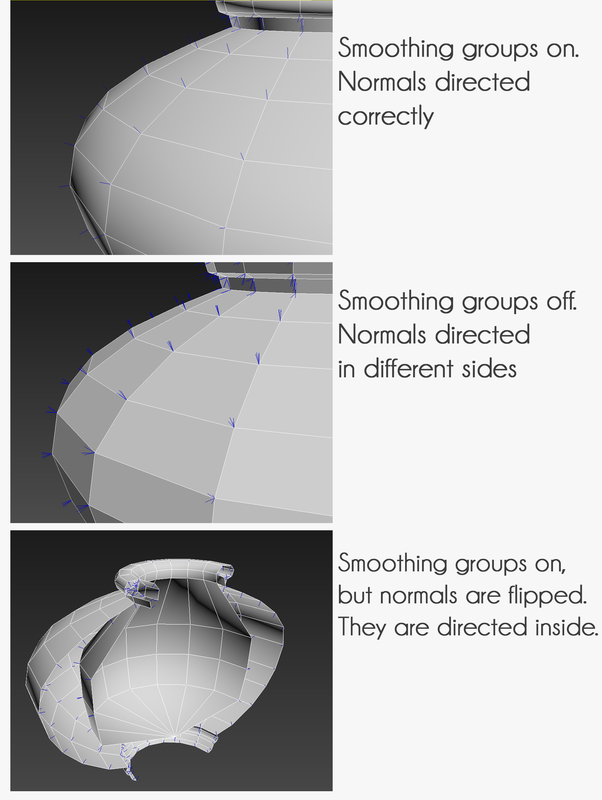 Flipped normals cause unpredictable results because they are turned inside out, and not correcting this is considered a bad practice. While it is possible to bake flipped normals, there could be a variety of issues that would appear when rendered. This information will at least help you understand where your mistake is if you have shading artifacts. Stay tuned for the next segment of the tutorial: chamfer operation and UV unwrapping!